Abu Dhabi: Abu Dhabi will build the world’s largest solar power plant in its push towards cleaner energy. The $870 million project, to come up in Sweihan, is a joint international collaborative effort by Abu Dhabi Water and Electricity Authority (ADWEA), Japanese company Marubeni, and Chinese manufacturer JinkoSolar. The plant is expected to completed by 2019, and the official signing ceremony for the ambitious project took place in the capital on Wednesday. The solar plant comes in line with the strategic vision of the Abu Dhabi Government towards diversifying its energy sources to keep up with rising energy demands, and moving to more sustainable and renewable sources of energy. Several high-ranking officials were in attendance to witness the signing ceremony, including Shaikh Mansour Bin Zayed Al Nahyan, Deputy Prime Minister and Minister of Presidential Affairs, and Shaikh Nahyan Bin Mubarak Al Nahyan, Minister of Culture and Knowledge Development. “This is an important occasion for Abu Dhabi’s development, and is represented by the launching of the world’s largest independent solar power plant,” said Abdullah Musleh Al Ahbabi, Chairman of ADWEA. “The tenders for the project was opened in April of last year … We received more than 90 proposals from the world’s largest companies in solar energy, which indicated the investors’ trust in the authority,” he added. Al Ahbabi explained that the solar power plant would be able to generate 1,177 megawatts of electricity, enough to provide power to hundreds of thousands of homes. “Today we are witnessing the launch of the largest solar power plant project of its kind in the world. The power plant will be opened in the second quarter of 2019, and will be able to produce 1,177 megawatts of electricity,” he said. “We are honoured to have this achievement which comes as a pillar for the nation’s development,” he added. Hirohisa Miyata, chief operating officer at Marubeni, who took part in signing the agreements, hailed the significance of the project, and said that the move towards clean energy was crucial. “Building this solar power plant is very important for renewable energy, the use of solar energy will gradually increase over time, and it will definitely play an important role in the world. This solar power plant will be groundbreaking. “We will work very hard [to complete this project], and I would like to come back here to celebrate again for the successful completion of the project in 2019,” he added. Abu Dhabi’s government-owned power utility has closed a Dh3.2 billion ($872 million) financing package for the world’s largest solar power plant, the utility’s top official said on Wednesday. Abu Dhabi Water & Electricity Authority (ADWEA) raised $650 million in debt with the remaining $222 million raised in equity, Director-General Saif Saleh Al Sayari told reporters. A consortium of Japan’s Marubeni Corp and China’s JinkoSolar Holding were selected this year to build and operate the 1,177 megawatt plant. “The financing which is completed is a $650 million project finance from local and international commercial banks,” Al Sayari said, adding that the 25-year loan is structured in a way that will allow refinancing after five years. Bank of Tokyo Mitsubishi was the leading arranger of the loan along with three other Japanese banks — Sumitomo Mitsui Banking Corporation, Mitsubishi UFJ Trust and Norinchukin Bank. French Banks — BNP Paribas Credit Agricole, Natixis — and First Abu Dhabi Bank were also part of the deal. 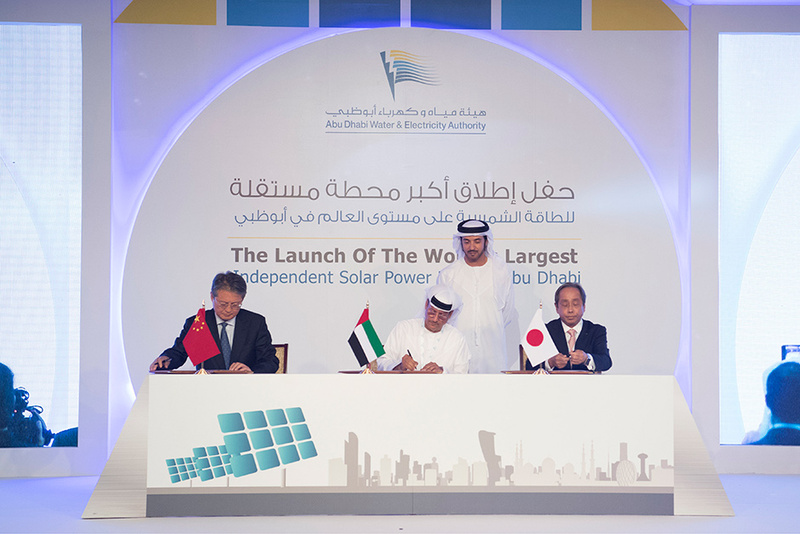 The equity portion will be contributed by ADWEA and the project developers Marubeni and JinkoSolar. Construction of the independent solar plant with a capacity of 1,177 megawatts will begin immediately with completion scheduled for the second quarter of 2019. The project is ADWEA’S first foray into renewable energy. Abu Dhabi aims to generate 7 per cent of its energy from renewables by 2020; the government’s green energy firm Masdar has launched renewable energy projects, including solar plants.